The gates opened at 8:30 a.m., but the beer sales didn't start until 11 a.m. The stands started slowly filling up until then, but emptied out when once the clock hit 11. My dad — the master of pacing that he is — imposed a strict-ish beer embargo until 3:30, not wanting us to join the hordes of peaked-too-early fans we saw last year. We’re veterans — we made it through last year and we were damn sure going to make it through this one too. A brief primer: the Rugby Sevens are an annual tournament held in Vancouver. Sevens is a form of rugby with seven team members — just under half as many players as a regular game — and played in two seven-minute halves. Over two days and 20 hours, 16 countries play 63 games. My dad and I had made it something of a tradition to go here since last year, and brought our South African friend Luke with us. From our front-row general admission seats, we could rub shoulders with the rabid Fijian fans and watch the teams warm-up. By the time we got to 12:30 p.m., the giraffe and turtle next to us were on their third beer each. 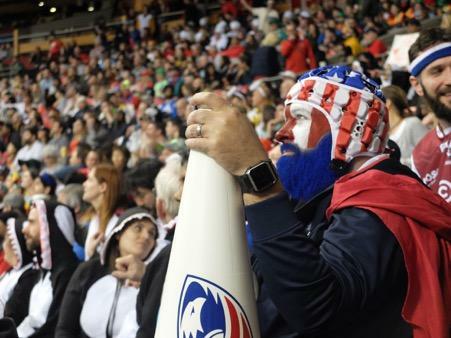 It’s tradition in the sevens to dress up in elaborate costumes, including but not limited to Donald Drumpf, Beavers, Emojis, a NASCAR pit crew, Lumberjacks, Mounties, RUN DMC, the Beastie Boys, Fighter Pilots, etc. The first day was the group stage — teams scoring points and wins that determine their standing in the next day’s finals. The USA rugby team beat Japan 50-0 and Argentina beat the brick-shithouse Fijian team on conversion. Unlike my dad and Luke, I didn't grow up playing rugby, but I glean what I can from some quick Googling and context clues. A man in the bathroom was peeing with his costume — and by extension, all of his clothing — around his ankles. His forehead was against the cinder blocks, his eyes closed as he used every piece of focus not to tip onto the guy next to him. I get woken up just after 10 a.m. still half-dressed, with Irish punk still thumping in my ears. We got to the stadium just after 11, right before the Canada-South Africa game which Canada lost, knocking them out of the running. The entire stadium smelled like a hangover, packed to the gills with fans shambling about in half-assed costumes. My friends, dressed as the aforementioned NASCAR pit crew, were looking haggard. To save money, we had skipped out on lunch. We decided instead to spend it on $8.50 cans of Budweiser. Me, my Dad and Luke opted not to pine for the front row, sticking to the 400-level seats. We had a bit more room to stretch out — and shorter beer lines. The people up there had time to go for more and more beer runs in quicker succession. Around 3:00 p.m. a man in a burger costume fell up the stairs. After your 50th game and 300th try, the games start to blend into one another. You hear “conversion falls wide” enough times and it just sounds like disconnected syllables. All the chicken fingers you’ve eaten and beer you’ve drank in the last few days give you a splitting headache, and bottles of water are $4.75. 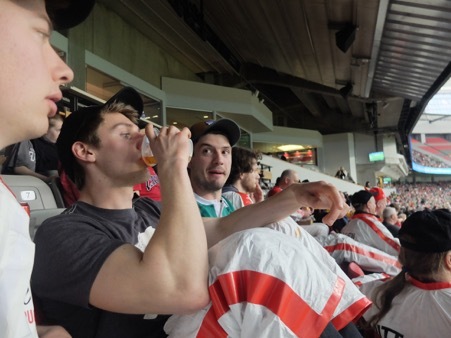 We snuck out just after the New Zealand-Argentina match, after the All-Blacks grabbed third overall. England eventually won the tournament over South Africa, but I wouldn't know — I was sitting in a dark room chugging coconut water, trying to undo the damage I’d done to myself.